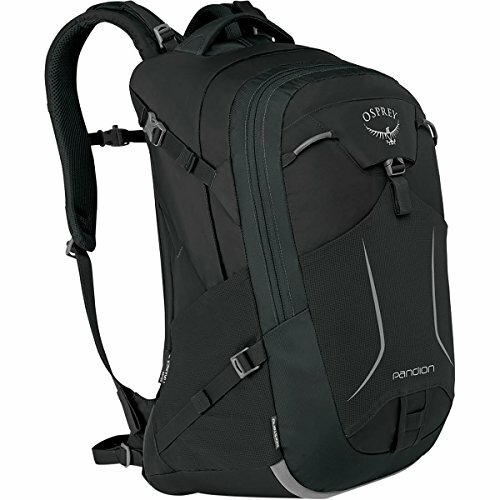 I use this Osprey Pandion pack mostly as a three day travel pack for business. While at 28L it is on the small size, I love the light weight, the mesh back, and the kickstand for travel. Starting with the main compartment, here is where I put my clothes and toiletries. I use a small packing cube for things that I can roll up like t shirts, and a pack-it folder for shirts. I have a LL Bean small toiletries bag. All these and one or more smaller organizer pouches fits in the main compartment together with my laptop. The laptop compartment is suspended and well padded. There is a document pocket in front of the laptop area, followed by a medium size slightly padded zipper pocket. Maybe a small tablet can fit in there. I seldom use that pocket because my iPad Pro only fits in the document pocket. The Pandion has a elastic front stash pocket that is extemely useful for travel. I stuff my light weight outer layer in there when I go through TSA Pre or in and out of cars. It probably won’t fit a winter coat, but any light weight puff jacket or hoodie will fit just fine. The Tropos has a center zipped compartment and I think is less useful. The Pandion also has two large elastic and mesh water bottle pockets on each side. They are very deep, certainly fits a large 20L bottle. During travel they are more useful as extra dump pockets for things like snacks as well. Finally there is a slightly padded, sunglasses pocket at the top of the pack that I use for dumping my phone when I go through TSA. There is a second compartment in the pack that runs the full height of the pack. The back wall has organizer pockets up top, and a zipper pocket in the bottom half. It is useful when I have random things I want to be able to get to quickly, like my Amazon Basics foldable iPad stand. This compartment is pretty deep (front to back) and I can fit my bond travel gear pouch in there with all my electronics. These are two innovative features of this osprey. I find the mesh back really comfortable for walking around the airport. Often I ended up walking 10, 15 mins or more around the terminals and the suspended mesh definitely makes the walk easier. Together with the load lifters, and the chest strap, the fully loaded feels like nothing during the walk. The pack comes with detachable half inch waist webbing, but I removed them since I don’t find that I need them. One thing about the mesh back — if I am wearing something smooth like a synthetic hoodie, the mesh tend to move slightly as I walk and I can hear a whoosh-whoosh side is it run against the synthetic materials. I read some reviews that said they do not like the kickstand and I never can understand that. Especially with the thinner profile Pandion (comparing to the Tropos) I find that the bag will stand on the kickstand 90% of the time. It is really useful when I am waiting in line at the TSA, or working in a conference room. I can just put the bag down anyway. This is a great travel pack for business. I have used this for 10+ trips in the last few months. My alternative is the Cotopaxi Allpa pack that I also like a lot. I can fit more things in the Allpa but I have to leave it at the hotel once I get to my destination. Whereas the Pandion I take that to work each day at my destination.